Windows XP and Windows 2003 administrators who are noticing difficulties like performance drops, application or system crashes while using the computer system that can be caused by third party applications that are overwriting shared system files of the operating system. System Administrators can run the sfc /scannow command to verify the integrity of all protected operating system files. The check will basically compare the current file with the original version and replace modified files with the original Microsoft version. It has to be noted that the command will replace all modified files even those that have been modified deliberately by a user of the system (e.g. a patched uxtheme.dll file to be able to use third party themes). Not everyone likes to use a command line version (that comes with several parameters) on the other hand. File Checker is a small portable software program that offers a GUI for the process. The program gives the system administrator the tools at hand to run most sfc commands from that GUI including starting a system scan, purging the cache or defining the locations of the setup sources. Options are available that can change the process further. 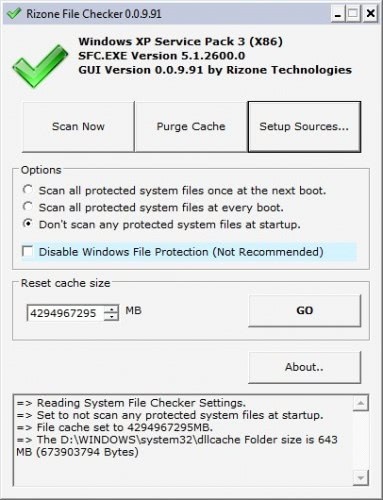 It is possible to reset the cache size to a new value, to disable the Windows File Protection and to define how protected system files should be handled by the scan. The Windows XP system file checker is a portable alternative for system administrators who like to work with graphical user interfaces. File Checker is available at the developer's website. Have a look at the text, Tekchip – it’s a wrapper for your command. You’re right. It was 3am. Remember kids commenting while tired is roughly equivalent to commenting while drunk. So don’t drink and comment! Can this be run/set so that it will NOT automatically overwrite files, but provide a choice on a case-by-case basis?